This episode is sponsored by GotoAssist.com. Try it free for 30 days. A few days ago my mobile phone at work was replaced with a Blackberry Curve. I’ve used many smartphones in the past, but this was my first Blackberry. I am still learning my way around the interface, applications, and their options, and I have to admit – I can see the attraction to this platform. It was only a couple days later that my Technorama co-host, Kreg Steppe, let me know that there is a new plugin available for the Blackberry that lets your standard Blackberry mail app work better with Gmail. Until recently you could send and receive email using the standard IMAP protocol, but that fell far short of the functionality that many Gmail users want including labels, stars, and more – causing them to download a separate app to manage their Gmail. Well, those days are over. With the Enhanced Gmail plugin for Blackberry, you can: Add and remove labels and stars from your messages, report spam, perform local and remote searches, archive mail messages, view related messages as a single conversation (also known as threads in other mail programs), and much more. The plugin requires Blackberry Device Software version 4.5 or greater and Google Mail Integration with the Blackberry service. Most of you probably already have this if you have a recent Blackberry. Begin by pointing your Blackberry web browser to blackberry.com/gmail. Be sure to follow the instructions carefully. If you have an existing Blackberry mail setup to Gmail, you will need to remove it and recreate it. It should also be noted that mail synchronization is one way, from the Blackberry device to Gmail. 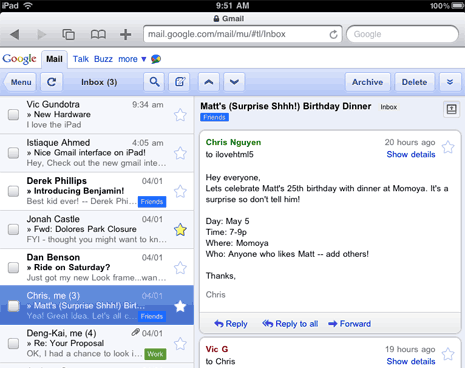 Many changes that happen on the Gmail web interface are not reflected on the Blackberry. To find out more, visit the link to the Blackberry forums, found in the show notes on the Gmail Podcast website. Finally, if you use the Blackberry Storm, this functionality is built in to version 2.0.0.13 so you won’t need to download this plugin. I don’t yet know if the enhanced Gmail functionality will be a standard feature of other Blackberry phones in the future. Stay tuned to the Gmail Podcast or visit the website for updates. Here’s today’s quick tip. Gmail now has a feature to email your task list. From the Tasks window, choose the Actions menu, and select “Email Task List”. A new message is composed with all the items in that list shown as bullet items and completed items are crossed off. This is a good way to show project status, or let someone know how busy you are and why you haven’t gotten to something they asked you for. Of course, you’ll want to make sure at least a few things are crossed off so you can backup your claims of being so busy. Finally, Gmail is rolling out the ability to easily import email and contacts from other email systems like AOL, Yahoo, and Hotmail. This feature was announced to new users in June of 2009 and existing users would be able to do this later. Well, now it’s later. if you want a refresher on the feature and how to access it, you can fid it on the Gmail Podcast recorded June 14, 2009. The short answer is that it is in the settings under accounts. That’s all for this time… Comments, suggestions, or questions can be sent to gpodcast@gmail.com or check the website for full information and archives of all previous Gmail tips at chuckchat.com/gmail. I have no affiliation with Google other than as a satisfied Gmail user. Special thanks to long time listener and Technorama co-host Kreg Steppe for pointing me to the Blackberry plugin. Thanks to you for listening, and don’t forget to write. This episode is brought to you by GotoMyPC.com – Get your free 30 day trial today! If you’re an iPhone or Android user, you’ll definitely want to look at the recent changes to the mobile web Gmail interface for those devices. Google has made some major improvements to the UI. First, Gmail mobile now supports labels for your email conversations very much like the desktop version. 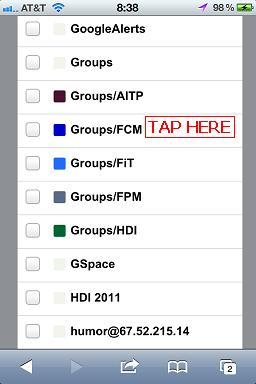 Now you can add color coded tags to respective emails for managing your inbox while you’re on the go. You can find the Label feature in the new “floating menu bar”, as I call it, that also has buttons labeled “Archive”, “Delete”, and “More”. Click on “More” and select “Label As” just below “Mute”. Another new addition is address auto completion of recipients’ names. Now you can simply start typing a name and Gmail will start filling in the name for you. Interestingly, these changes to the iPhone and Adroid platform came at the same time in April 2009 when they completely redesigned their mobile application. This is a change from previous enhancements which came out on the larger target audience of the iPhone first. This new Gmail interface is available for iPhone/iPod Touch with OS 2.2.1 versions and Android-powered devices in U.S. English language only. Look for more nice tweaks to the mobile version of Gmail in the future and keep listening to the Gmail Podcast to stay up to date on them.